Vision statements - why not say what you REALLY mean? I'm working with vision statements and strategic planning right now. Man - this an area that is really misunderstood and misused I think. Also, and that's what this post is about, I think it's deliberately this way in order to get some wiggle room. I don't understand that. We'll get there.DefinitionsAs always I've learned a great deal while diving into this area again and here are the definitions that we are using and that I think is clarifying:Mission statement - Why are we here? What is our purpose? For example; Why do the Salvation Army exists in Indonesia? Vision - when we are doing the mission perfectly - what would that look like? This is a dream, a target and something to aspire to. Strategic plan - how will we get from where we are today to the vision? Business plan - what kind of actions and resources will our strategic plan require from us? When or in which order are we planning to do the actions? What is this good for?Guidance. If you read this blog you know that I'm not specifically into detail planning. I don't think it's feasible. For one simple reason; the future is unknown. It's really the only thing that we know about it - it will not be exactly how we planned it. However - the list above is very handy anyway I think. Most of the points are not about planning but guidance, alignment and policies for how we act. In that regard this is greatly valuable. Hey, it's one of those days, I even think that the last point (that is planning) could be useable. This too will show us where we planning to go. From where we are now. With what we know. As long as we understand that these things will change, there's no problem. There's a problem hereHowever... I found that many organisations are VERY reluctant to change these lists. To be quite frank the first point (the mission) maybe shouldn't change. That would mean to change the whole reason for the organisations existence. That is basically destroying the organisation and rebuilding it into something completely different. But the vision... might change. If we need to do some drastic adaptations to a new reality for example. Just imagine how the Internet has changed business models. The vision for companies like N.Y. Times and CNN I imagine shifted radically with the new possibilities in a new media. From Kanban in ActionStrategic plans is very interesting, I think, and here we should be prepared to change much more than the previous ... levels. This has to do with a very important part that I've wrote in italics above: "where we are today". This is also one of the really powerful tenants of kanban: "start where you are - change in small steps". The Commissioner of the Salvation Army (CEO in business terms) in Indonesia told me an old English joke that is suitable here:A man drove up to a woman on the sidewalk, in London, and asked: "How do I get to Piccadilly circus from here?" The woman responded:"Oh... that's hard. I wouldn't start from here" This is funny (or well...) because it shows that we often don't take the reality into our plans. You know what - it's out there. There's no use lying to ourselves and plan from a place where we not are now. This is how it looks, this are our financial state, these are our customers etc. Now - let's improve towards the wonderful state our vision talked about.The last part, business plans, is just an example, suggestion in my mind. Here one could benefit greatly from the thinking behind rolling wave planning; for things that is close in the future (next week) we have more details planned, for things that further in the future we leave details out.Remember that you hold the dial for how much details you put in there. And hence your disappointments... You were speaking about a problem?Oh, forgot about that... Well the problem I have seen a lot is that people and organisations in them are very reluctant to change. About anything. Especially vision statements. So we write very lofty statements, with big fluffy words like "holistic", "empower", "best within selected areas", "leading" and "famous".Often when I don't understand or if I question if what we do really fits into the vision the answer is (had this experience with many clients):Well, you could say that holistic means... Best really means that we are ...The intention of leading was more like ...This is playing the victim blame game a bit. If it was your intention - why not write that then? How am I supposed to understand what you mean when your vision said something that was so lofty that I didn't get it the first time around?Either it was a mistake or, you didn't want to be clear and crisp on purpose. Most organisations spend a lot of money and time doing these statements, so the it's probably not lack of competence. So why are we unclear on purpose?The answer that comes back again and again to me is; because it's hard to change those. In some organisations the vision statement is written into the constitution. I'm in one right now. Updating the vision means that we need to reregister legal documents etc. etc.So what? To me it's much better to be clear and understandable with the vision that to avoid work. The vision is intended to guide us and show us what to do. Please make those directions clear.SummaryGood indicators and guides are hard to write. It's hard to get it right. But once created can prove invaluable to help and guide people in your organisation. What is your approach to the problem that they are hard to write? Do you think really, really hard and then carve it in stone write it once so that you never never have to change this again? Or do you change your process here so that you think hard for a short while and then make it easier to change and communicate - so that you have a living dialog about your vision and strategy. You choose. I'm working with vision statements and strategic planning right now. Man - this an area that is really misunderstood and misused I think. Also, and that's what this post is about, I think it's deliberately this way in order to get some wiggle room. I don't understand that. We'll get there. Mission statement - Why are we here? What is our purpose? For example; Why do the Salvation Army exists in Indonesia? Vision - when we are doing the mission perfectly - what would that look like? This is a dream, a target and something to aspire to. Strategic plan - how will we get from where we are today to the vision? Business plan - what kind of actions and resources will our strategic plan require from us? When or in which order are we planning to do the actions? Guidance. If you read this blog you know that I'm not specifically into detail planning. I don't think it's feasible. For one simple reason; the future is unknown. It's really the only thing that we know about it - it will not be exactly how we planned it. However - the list above is very handy anyway I think. Most of the points are not about planning but guidance, alignment and policies for how we act. In that regard this is greatly valuable. Hey, it's one of those days, I even think that the last point (that is planning) could be useable. This too will show us where we planning to go. From where we are now. With what we know. As long as we understand that these things will change, there's no problem. However... I found that many organisations are VERY reluctant to change these lists. To be quite frank the first point (the mission) maybe shouldn't change. That would mean to change the whole reason for the organisations existence. That is basically destroying the organisation and rebuilding it into something completely different. But the vision... might change. If we need to do some drastic adaptations to a new reality for example. Just imagine how the Internet has changed business models. The vision for companies like N.Y. Times and CNN I imagine shifted radically with the new possibilities in a new media. Strategic plans is very interesting, I think, and here we should be prepared to change much more than the previous ... levels. This has to do with a very important part that I've wrote in italics above: "where we are today". 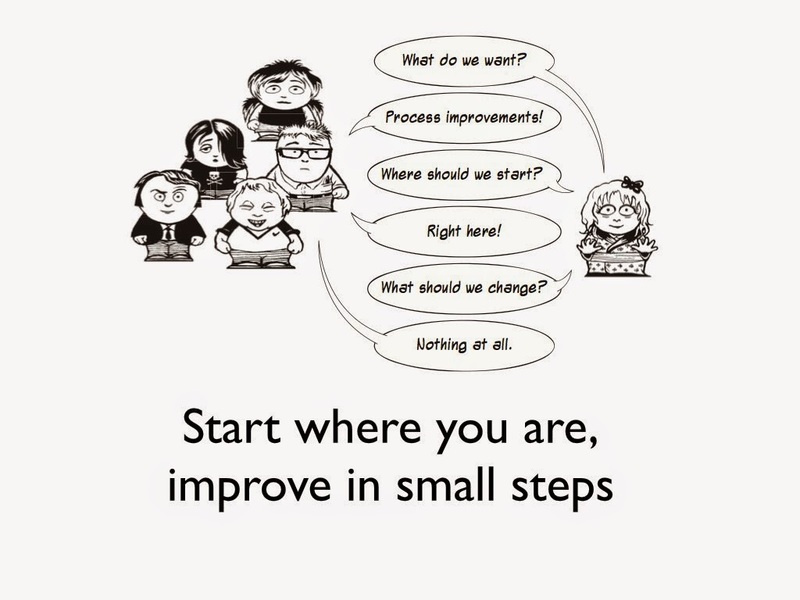 This is also one of the really powerful tenants of kanban: "start where you are - change in small steps". "How do I get to Piccadilly circus from here?" "Oh... that's hard. I wouldn't start from here"
This is funny (or well...) because it shows that we often don't take the reality into our plans. You know what - it's out there. There's no use lying to ourselves and plan from a place where we not are now. This is how it looks, this are our financial state, these are our customers etc. Now - let's improve towards the wonderful state our vision talked about. The last part, business plans, is just an example, suggestion in my mind. Here one could benefit greatly from the thinking behind rolling wave planning; for things that is close in the future (next week) we have more details planned, for things that further in the future we leave details out. You were speaking about a problem? Oh, forgot about that... Well the problem I have seen a lot is that people and organisations in them are very reluctant to change. About anything. Especially vision statements. So we write very lofty statements, with big fluffy words like "holistic", "empower", "best within selected areas", "leading" and "famous". This is playing the victim blame game a bit. If it was your intention - why not write that then? How am I supposed to understand what you mean when your vision said something that was so lofty that I didn't get it the first time around? Either it was a mistake or, you didn't want to be clear and crisp on purpose. Most organisations spend a lot of money and time doing these statements, so the it's probably not lack of competence. So why are we unclear on purpose? The answer that comes back again and again to me is; because it's hard to change those. In some organisations the vision statement is written into the constitution. I'm in one right now. Updating the vision means that we need to reregister legal documents etc. etc. So what? To me it's much better to be clear and understandable with the vision that to avoid work. The vision is intended to guide us and show us what to do. Please make those directions clear. Good indicators and guides are hard to write. It's hard to get it right. But once created can prove invaluable to help and guide people in your organisation. What is your approach to the problem that they are hard to write? Do you think really, really hard and then carve it in stone write it once so that you never never have to change this again? Or do you change your process here so that you think hard for a short while and then make it easier to change and communicate - so that you have a living dialog about your vision and strategy.